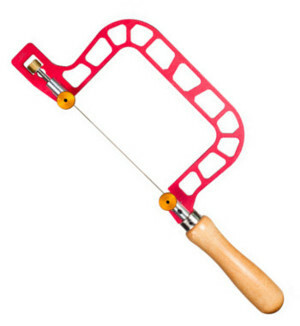 Why have the saw frames sometimes minor bends? 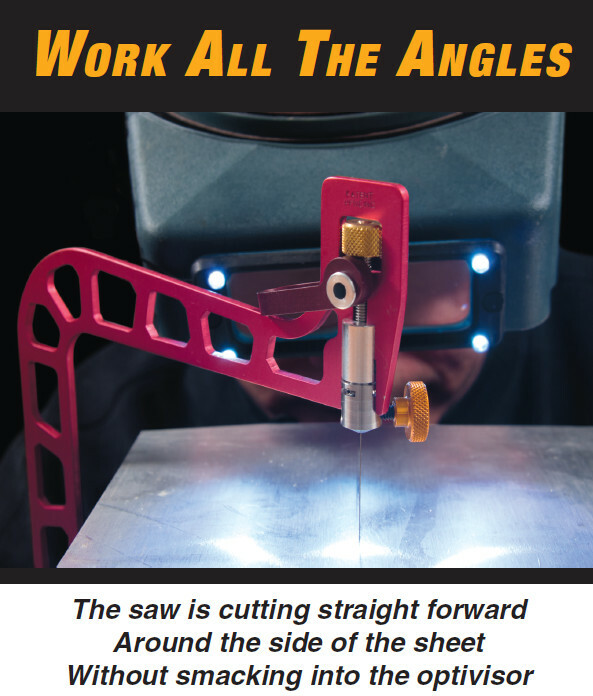 Small bends of the saw frames are common from the heat of the laser when they are cut. 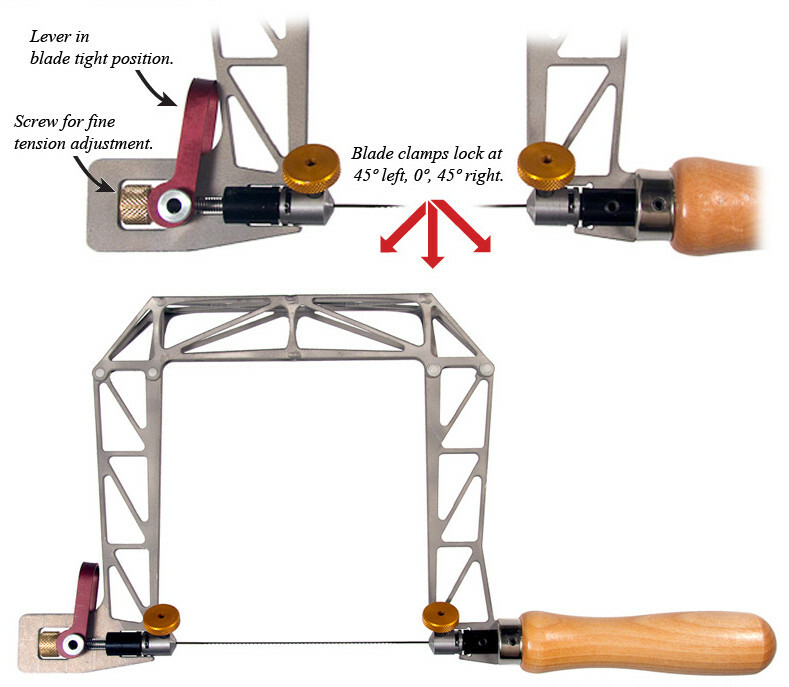 Minor bends like that on the picture do not make any difference to the performance or accuracy of the saw. 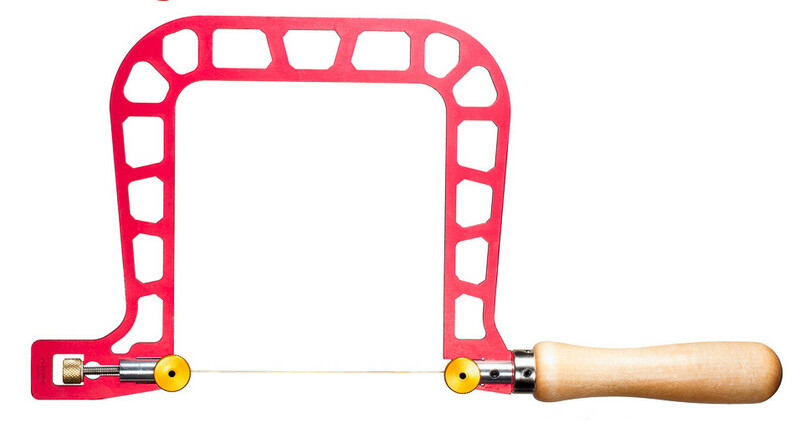 The screw tension saw was the origin of the Knew Concepts Fret saw line. It is the economy model. 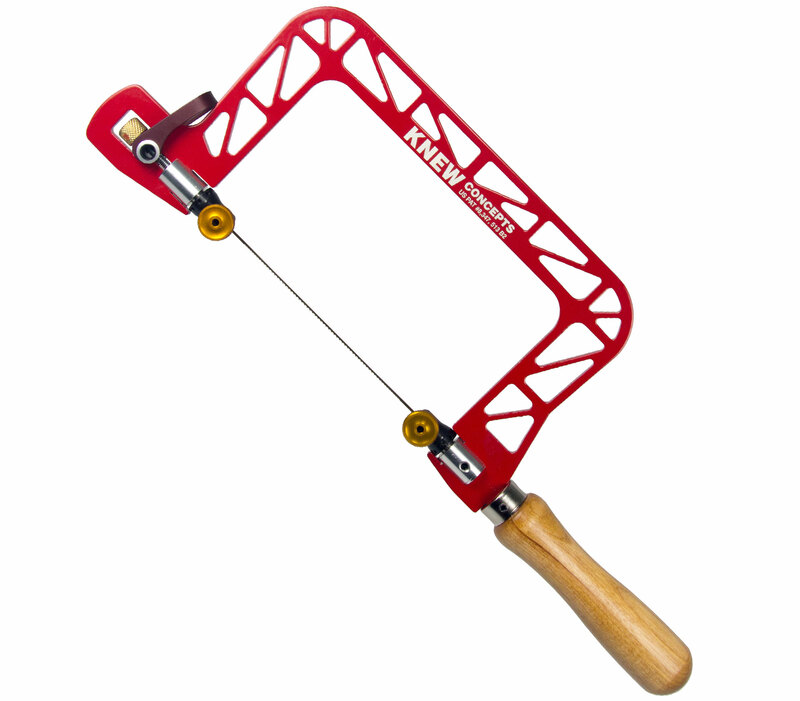 It provides extremely precise blade tensioning simply by turning the knurled tension nut at the top of the frame. 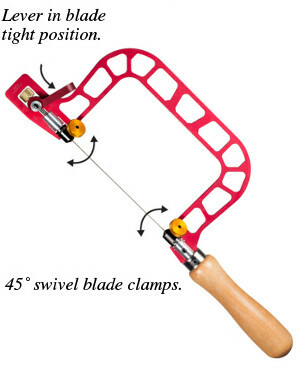 Designed for rapid, repetitive blade changes (when piercing for example). The tension does not change when re-setting the blade. 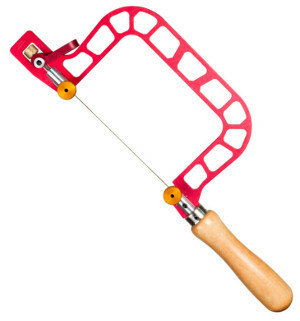 Simply flip the lever forward to release tension, re-position and clamp the blade, and flip the lever to the rear, and you are sawing. Designed to swing the rear of the frame out of the way. The ability to set the frame into a "neutral corner" frees you to saw into areas that were never possible before. It swivels 45° degrees either to the Right or the Left, and has a lock at the “straight ahead” position. Truly the ultimate in saws. The strongest, most rigid Fret Saw available on the market today! Its spine is a welded titanium beam, the blade is tensioned with a Lever that can tension blades so tight they “ping” with notes never heard before, makes turns that are tighter than ever before, and the blade clamps lock at 45° left, 0°, 45° right. Weighs only 6.0 ounces (170 g). When you are going for fine detail work, such as inlay or marquetry and are using an Optivisor for seeing the line, by swiveling the frame to the detented 45 degree position (either R or L), the frame will not bump into your headgear. The greater the blade tension on your fret saw, the more precisely you will be able to cut with it. 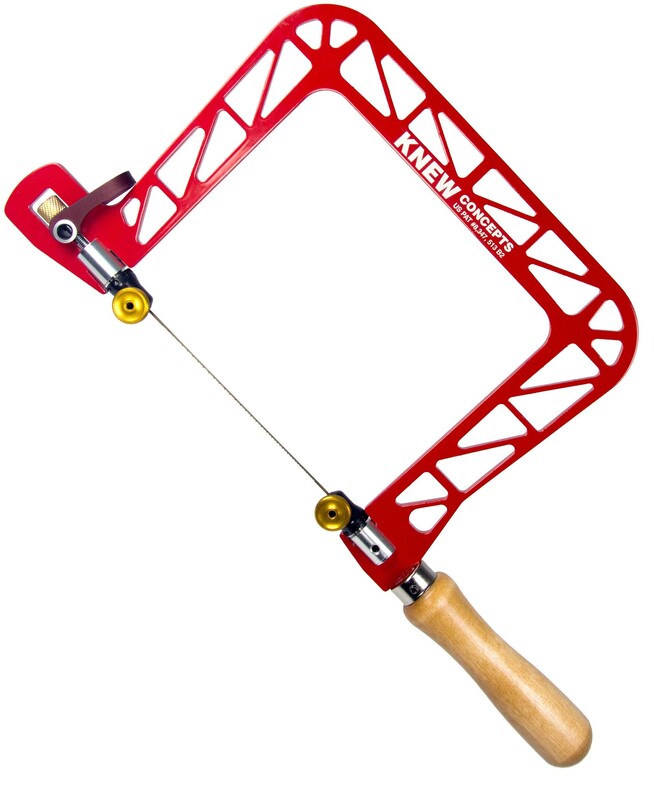 Knew Concepts have always been known for ultra-lightweight fret saws which can be tensioned a decent amount despite their featherlight weight. 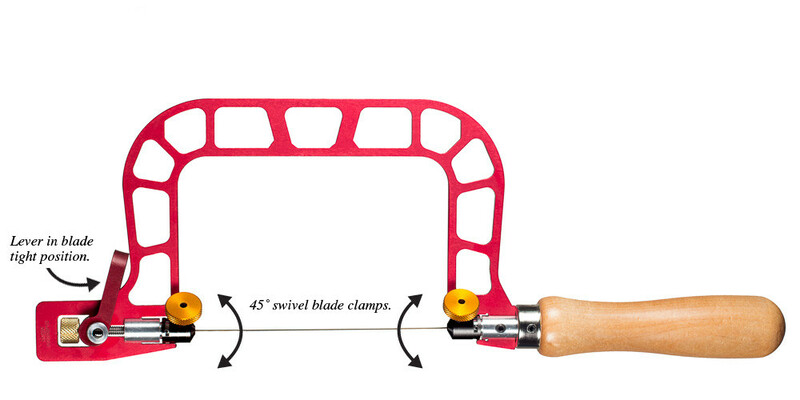 The larger the saw bow, the more difficult it is to achieve greater blade tension. That is why the blades of existing fret saws from Knew Concepts can be tensioned to a value that is dependent on the size of the saw bow. 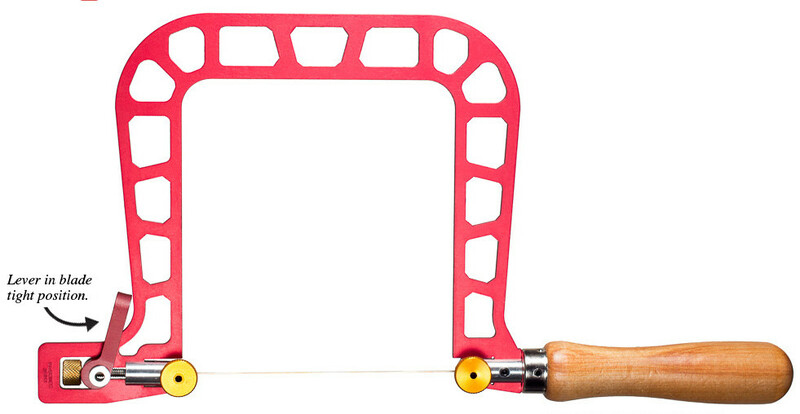 The blades of traditional saws with a 3-inch bow can be tensioned to approx. 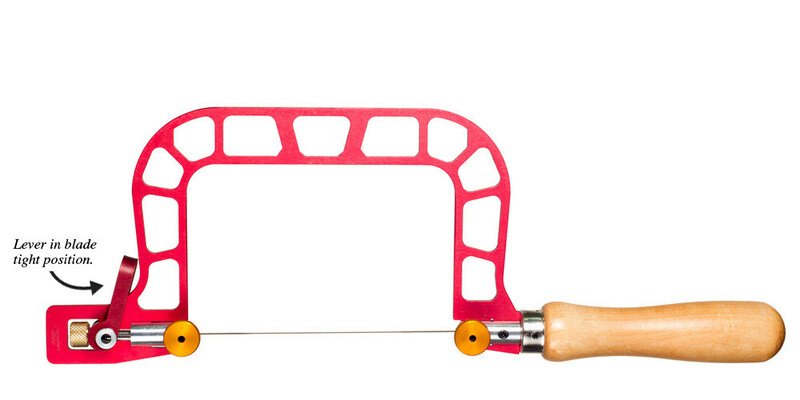 12 kg, those on a 5-inch bow up to 8 kg and those on a 8-inch bow up to 4 kg. By contrast, the saw blades on the new MK IV line can be tensioned more than twice as much as blades on traditional saws, viz. 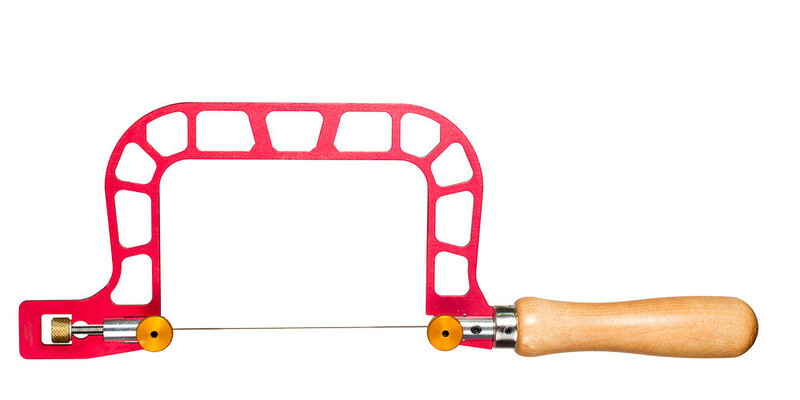 25 kg for the 8-inch bow and higher for the two smaller bows. The exact values are purely academic because a tensile force in excess of 25 kg would result in blade fracture. This all comes at the cost of a thicker frame, increased length and greater weight. The new frame is 4.8 mm thick, previously 3.2 mm. The new 3-inch saw weighs 195 g, previously 130 g (5-inch new 240 g, previously 145 g; 8-inch new 300 g, previously 175 g). The new overall length for all sizes is 37 cm, previously 34 cm. 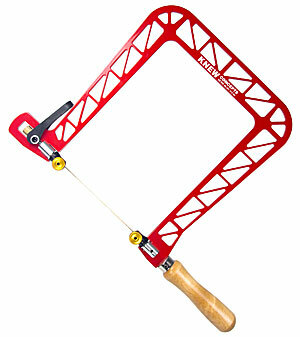 Typically, the new saws are stronger and less likely to vibrate. A further benefit of the new Mk IV line is that blades can now be rotated by 360° with locking positions every 45°. The extra length is a function of the fully rotating blade clamps. There must be extra room in the frame for the knobs to rotate through the frame. 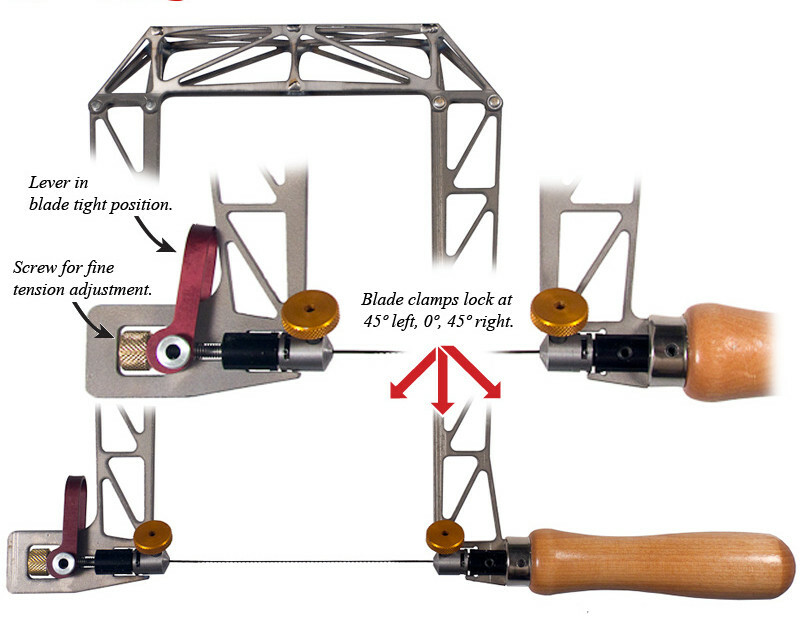 These particulars do not apply to saws with titanium bows which permit a blade tension of over 35 kg. The titanium saws are exceptionally light, but unsurprisingly come with a price tag well above those of standard saws. The old saws we will continue to supply them: they are genuine lightweights and thanks to their shorter format very easy to handle. To adjust the blade screw clamps or to convert the saw to left-handed operation you need a a common 2 mm allen key. 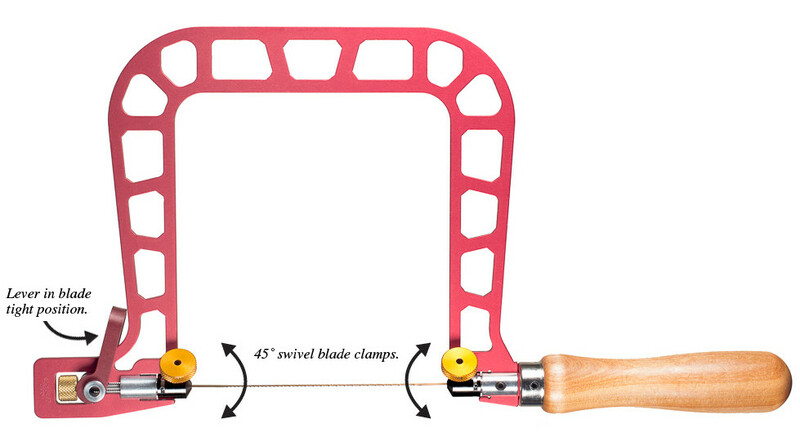 Here’s a video how to adjust or readjust the blade screw clamps. This video shows how you install and tension the blade correctly. This video shows how you convert a saw from right- to left-handed operation. 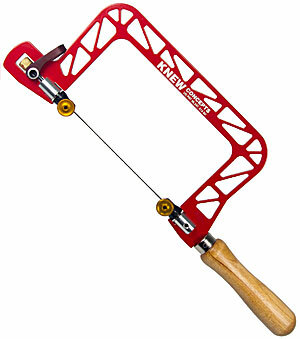 Why not also have a look at the Knew Concepts Coping Saw!